If you really enjoyed Mad Magazine back in the 80’s and 90’s then this is going to rock some happy childhood memories for you. This has all the look and feel of reading a Mad Magazine story line, including some of the snark, but also some down to earth story telling that makes the reader fall into the story line beautifully. The art and lettering harkens back to that wonderful day when I got my first Mad Magazine because they had Space 1999 as the parody series (big fan), and my love affair went on from there. This graphic novel really helps sink into why child me loved this magazine. This follows the standard Scrooge/Christmas Carol story line so no deviations there, it’s fairly faithful to the Charles Dickens line, but every once in a while, I ran into a sentence or two where I’m rereading it and trying not to snort coffee out my nose. They really did a great job on this one, and I think you and someone who is 10+ will really dig on this comic book. Rating it five of five stars, mostly because it’s brilliantly executed, and a lot of fun to read. Do check this one out, especially if trying to get the kids into sequential storytelling, this is a great place to start. 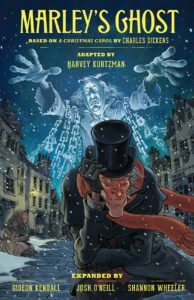 Marley’s Ghost is the posthumous completion of legendary creator Harvey Kurtzman’s adaptation of the classic Charles Dickens’ novel—A Christmas Carol. Kurztman’s ambitious concept for Marley’s Ghost began in the 1950s—as an early “graphic novel”—but was never realized. Now, over 60 years later, writers Josh O’Neill and Shannon Wheeler expand upon Kurtzman’s extensive adaptation notes while illustrator Gideon Kendall’s outstanding artwork utilizes Kurtzman’s breakdowns and stylistic choices to make this long-lost vision a reality! You can see our overly enthusiastic review of this comic book on YouTube right here at this link. Don’t forget to do all those YouTube things, like, love, share, subscribe, and comment.